tended to carry a wide variety of weapons but only used a shield for protection. The ancient Slavs were prolific and proficient at building fortifications. Using timber and earth construction they fortified naterally defensive positions. Using hills, waterways and even swamps to their advantage. The ancient Slavs never had it particularly easy. They always seemed to be between powerful adversaries; stuck between the warlike Germans and the martially powerful steppe nomads or developing between the Frankish and Byzantine Empires, the super powers of their day. To the North of the Slavs lived the fierce Scandinavians, a society that produced the mighty Vikings and who conquered many lands. Yet amazingly the Slavs survived, and bewilderingly, they even thrived. Slavic tribes burst forth from their homeland and conquered and settled half of Europe, forever changing the history of the continent and the world. Few of the lands that were slavasized by these ancient warriors were ever taken back by their opponents, and the migration of the Slavs continue to this day, particularly in their ancient drive to the East. Yet, the ancient Slavs that achieved this great expansion were never considered to be one of the great warrior societies in history. The migration period was a time of great power shifts in Europe as the old Roman Empire broke up and then finally collapsed. During this breakdown of Roman authority many barbarian tribes took advantage of the situation to find new homelands. These barbarians as the Roman and Greek world referred to them were led by Germanic and steppe nomad tribes like the Huns who punched through the boarders of the then week Roman Empire. Behind this first waves of barbarian invasions followed the Slavs, claiming the sparsely populated areas of the other barbarian tribes had migrated from and also carving out their own section of the old empire. In the deep forests of Europe Indo-European cultures had been developing for centuries and their populations began to poor out. These were the Slavs and all their nations were made up of peoples in arms. The Eastern Romans, or Byzantines, considered the Slavs to be unsophisticated and backwards on a cultural level. However their simpler self sustained communities resemble the ancient Spartans and early Roman Republic in their military organization, farmer soldiers fought on the battle lines. This made them hard to dislodge from territory they had gained, due to their toughness this could be a costly affair. Unlike the ancient Greeks and Romans the Slavs also employed raiding tactics. Through the use of speed and surprise they took advantage of more armored opponents. 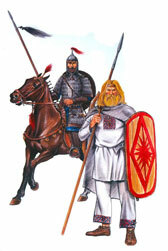 Later the Slavs also took to the use of armor but they typically combined it with their cavalry. Despite their lack of armor the Slavs proved to be a match for the sophisticated and armored Roman military and Greek warriors. Past historians gave the early Slavs a dove like reputation, particularly when compared to the warlike reputation of their neighbors. This mostly undeserved reputation may be due to the Slavs practice in the Balkans of setting up agricultural settlements around fortified cities while often leaving the cities unmolested. The Slavs did contributed more to agriculture innovation then to the arts of war. Their use of crop rotation and the mould-board plow allowed for greater production in tuff soil. The mould-board plow according to Medieval Life & the Hundred Years War, by James F Dunnigan and Albert A Nofi, allowed the early Slavs to become efficient farmers. “This elaborate metal and wood device was developed by Slavic tribes and spread west from the 6th century on. Its design allowed six or more oxen to pull a plow and break up virgin ground, or the heavy, clay laden soils typical of northern Europe. As an example of the impact of this new plow, consider the huge population growth that occurred after its introduction.” History has proven over and over again, an increase in food production allows for an increase in population and a larger population can be converted to military force. One ancient writer noted that if the vast number of Slav tribes ever united no nation could resist them. However, while the early Slavs aren’t known for military innovation they were generally equivalent to their tribal neighbors in this regard. Whatever edge they may have lacked in military innovation and organization they made up for with the disruptive raids and the sheer brute force of overwhelming numbers that their advanced agricultural allowed them to support. In fact their agricultural nature, combined with their self-sufficient lifestyle, meant that when they took over areas they were there to stay. In fact their decentralized nature made them extremely difficult to defeat, as they had no great king to bribe or defeat in battle. The Slavs expansion of the 5th – 7th centuries reached from the Rhine, to Southern Greece and the Russian steppes. Although experts disagree about how it happened, they all agree that within the short span of 150 years and amazingly uniform culture took over half of Europe. They formed an egalitarian society with Slavic as a common language. Besides agriculture they practiced bee keeping, crafts, trade, metal working, and carpentry, herding and hunting. The independent nature of the Slavic tribes contrast with the dependence of the marauding steppe horsemen on settled populations. Ironically, groups like the Huns who created so much destruction in the empires of their day needed those same empires for supplies and gold to pay their hordes. These nomadic groups only made camps and when they dispersed they left nothing lasting behind, unlike the Slavs who permanently settled and absorbed the local populations. These ancient warriors are described as being unusually tall and strong, Slavic warriors typically used a wide range of weapons. A single warrior may carry a shield, spear, ax, sling and bow. They were known for their Spartan life style and ancient writers recorded that they were often quick to attack. They used bows and three bladed arrows similar to those used by the steppe nomads. Early armies consisted of only a few hundred men who could move quickly into enemy territory and quickly retreat. The ancient historian Procopius tells us in Wars VII.14, 25, that the Slavs "fight on foot, advancing on the enemy, in their hands they carry small shields and spears, but they never wear body armor".” As the Slavs expanded they began using combined arms tactics, with archers, cavalry and infantry working in unison. Their armies used speed to their advantage and often employed ambushes, flanking assaults and guerilla tactics. They learned how to take fortified cities using siege weapons from the Byzantines and learned cavalry tactics from the steppe nomads. In the North they learned to use Viking style long ships, and even raided Scandinavia giving them a taste of their own medicine. The Slavs may have exchanged their knowledge of bridge building with the Scandinavians in exchange for knowledge of ship construction. After the collapse of the Western Roman Empire during the 5th century the Germanic tribes began migrating into the territory of the former empire. The Slavic tribes then migrated into the depopulated lands of Germany, absorbing those that had stayed. By the 6th century the Germanic tribes, then living in France became dominated by a tribal federation called the Franks. Soon the Christianized Frankish Empire controlled much of what had been the Western Roman Empire. The Franks set up marches on their Eastern frontier that bordered the Slavs, attempting to convert or destroy the western tribes on their border. This forced the Slavs to form their first State or super tribal union, known as Samo’s Empire. The story of Samo’s is amazing; he was a Frankish trader who gained the trust of the Slavic tribes and became leader of a large confederation. The Slavic tribes located roughly around what is now Austria recognized him as King. Samos led their forces in several victorious campaigns against Frankish armies. However, his amazing empire didn’t survive his death, but other Slavic nations appeared first in bohemia then under the leadership of the powerful Polanie tribe who later formed the early Polish nation. Other Western Slavic tribes, called Wends by their contemporaries, failed to unite into nations and continued their tribal organization and pagan religion. The Wends had a culture of raiding, which made them terrible neighbors, launching both Viking style raids, cattle raids and larger invasions against the Franks and Danes. Over the next 400 years a constant state of warfare existed between the Wends and their Germanic neighbors. Eventually, the Wends, worn down from continuous warfare succumbed to the pressure and lost their Pagan religion, freedom and much of their Slavic culture, pinched between the endless German offensives and the expanding nation of the Polanie kingdom. As the percentage of Slavs increased in the many regions of East and Central Europe they absorbed the local populations, converting them to their culture and language. In the East they spread out into modern Belarus, Ukraine and Russia. They also formed the lion’s share of the population of the Kievian Rus state. As the Slavic tribes migrated east they displacing the Baltic and Finnic tribes, gaining a large swath of land which they continually, although suffering major setbacks, enlarged to the North and East. In the East Slavic tribes came in contact with the powerful steppe nomads from the earliest times. The early Slavs where at times resentful subjects of these tribes and at others willing allies. Perhaps the most common situation was that they avoided the open plains, while the mounted raiders, respecting the Slavic warriors avoided the forests. The Slavs gained much experience and military skill from their associations with these nomadic tribes, at first Scythians, Sarmatians and Huns. Later these nomadic horsemen from the steps included the hoard’s of the Bulgars, Antes, and Khazars and finally culminating with the Mongols in the medieval period. It seems that these hordes typically passed through the Pontic lands on their way west, although occasionally groups remained for longer periods. As the Slavs spread to the East they formed early tribal centers that included Novgorod, Izborsk, Polotsk, Gnezdovo, and Kiev. Around 880 AD, the Kievian Slavs, along with a quickly Slavisized Scandinavian core, formed the Kievian Rus State. This early Eastern European state dominated the trade routes between Scandinavia and the Byzantines and frequently laid siege to Constantinople. However, they were defeated and conquered like so many others by the expanding Mongol Empire in the 1240. Many Slavic Tribes also migrated to the South, invading the lands of the Balkans and Greece. At the time of their arrival the Roman Empire was in crises and collapsing in the West. The ancient Slavs poured over the borders into the partially depopulated Balkans, a land troubled by Huns and marauding Goths where imperial authority had collapsed. It was the Byzantines who would give us the best picture of these hither too unknown people, separated from civilization by other illiterate barbarian tribes. In his work De Bellis, the Byzintine writer Procopius portrays the ancient Slavs as unusually tall and strong, with a tan complexion and reddish-blonde hair. He describes them as living a rugged and primitive life, dwelling in huts, often distant from one another and frequently moving from place to place. Politically they were not ruled by a single leader, but for a long time lived in a "democracy" (or anarchy). The Slavs are described as being resentful of any attempts to rule them and resisted any attempts violently. The ancient Slavs believed in many Gods, but Procopius suggests they believed in one, perhaps supreme god. 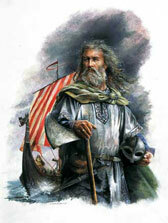 He is often identified as Perun, the god of thunder and lightning. Procopius describes this belief , saying the Slavs, “acknowledge that one god, creator of lightning, is the only lord of all: to him do they sacrifice an ox and all sacrificial animals”. Today the word Perun means thunder or lightning bolt in several Slavic languages. Procopius further describes the ancient Slavs as going into battle on foot, charging straight at their enemy, armed with spears and small shields, but without armor. The invading Slavs penetrated through the Balkans and all the way into the Peloponnese of Southern Greece. Despite Byzantine accounts of the ancient Slavs "pillaging" and "looting", many indigenous peoples voluntarily assimilated with the Slavs. The Slavs lack of an organized, central authority actually hastened the process of willful Slavicisation. The Roman subjects of the territories settled by the Slavs slowly became assimilated with the body of Slavs. All was not Harmonious however, the Slavs laid siege to Thessaloniki from 614-616 AD. John, Archbishop of Thessaloniki wrote the following regarding the attacks, "In the field by the holy temple, a man saw a not very numerous barbarian army (as we counted them together up to five thousands), but very strong, as it consisted of selected experienced fighters... and until late in the night they fought, and the people of the victor [the protectors of Thessaloniki] exposed themselves to great risk while they attacked and retreated, because as said, they had the selected flowers of the entire Slavic people for their opponents. Finally, when help arrived, the Barbarians were expelled and they retreated." However, in the same text, The Miracles of St. Demetrius of Thessaloniki, it is recorded that in 877 “all the Thessaloniki people spoke pure Slavic". The Slavs also were involved in sieges against Constantinople itself, along with a collision of Bulgars, Avars and Gepids. By 700 AD, Slavs inhabited most of the Balkans, from Austria to the Peloponnese, and from the Adriatic to the Black seas, with the exception of the coastal areas of the Greek peninsula. As the Byzantine Empire and the encroaching Frankish Empire found the Slavs hard to rule do to their distaste for centralized authority. However, as time passed and the Slavs merged with other groups in the regions different nations began to form. Ancient Slavic tribes like the Croats and Serbs retained their own names when forming nations while the South Slavs did not, adopting the names of those they merged with even though they still spoke a Slavic tongue (Bulgarians) or even a Slavic/Latin language like the Romanians. Other Southern Slav peoples include the Bosnians, Macedonians, Montenegrins, and Slovenes. Eventually, during the 8th – 10th centuries the Slavs began to form nations. The once cohesive Slavic culture fragmented as the new nations were influenced by the long settled civilizations they bordered. Roman Catholic missionaries converted the Western Slavs while the Eastern Slavs became heavily influenced by Byzantium and Eastern Orthodox Christianity. The Slavic tribes created many nations throughout Europe and expanding into Asia, leaving a lasting mark on history. The ancient Slavs rose from relative obscurity to becoming one of the great forces of the world primarily due to their expansion from the 6th to 8th centuries AD and their stubborn ability to hold these lands throughout the ages.